Today I hopped on the train up to Leeds to attend the Benefit Northern Bloggers event, hosted by Michelle, Leanne and Adele (who are all managers at Benefit).Now, I know, I'm not Northern... but Leeds really isn't far from me at uni and who can turn down a Benefit event?! Little did I know or even anticipate that we'd be given a soon-to-be-released product, an exclusive, it's not released until 28th June! But I'll come onto that in a second. 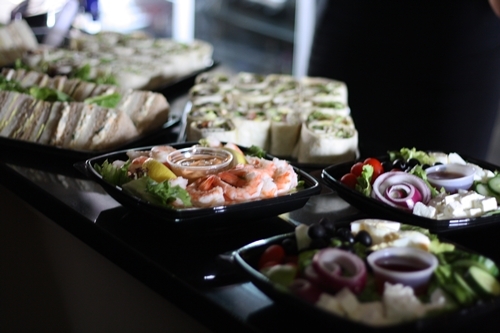 First off, just a few pictures from the event. 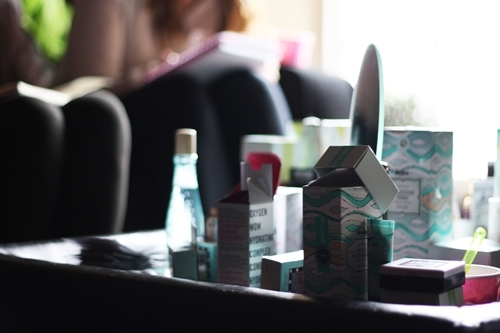 There were Benefit products galore dotted around the room.We were free to try these out as we wished and we got to see them applied by a professional (Adele!). We were also given a little presentation by Michelle about the history of the brand, about their upcoming Mascarathon and an exciting new product. I didn't realise how long Benefit had been around for (since 1976) and we were told all about their packaging, philosophy and much more. I'm sure most of you will be wondering what a Mascarathon is, well, Benefit are raising money by doing a marathon, all the way from Edinburgh to London, for the charity Refuge - a charity for victims of domestic violence. As a sociology student, this is a cause quite close to my heart and I've just given my donation. Here's the website if you would like to donate too. They are hoping to raise £20,000, which I think is such a brilliant thing to do and they've even got some celebs involved, such as Caroline Flack and Jeorgie Porter. 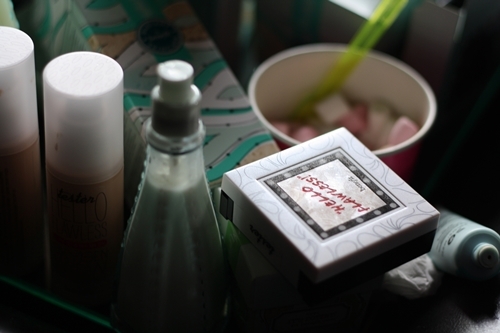 Now, if you're a Benefit fan, you might have used their Box o' Powders. If you have, or even if you haven't, you might be interested to know about this new release from Benefit. It's a lip gloss, retailing at £13.50, corresponding with the Box o' Powder shades. I'm not one for lip gloss usually, but honestly, these are so lovely! 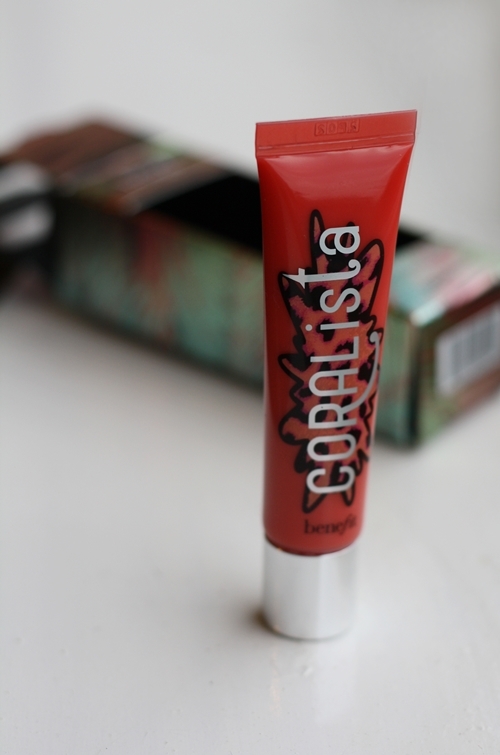 I received the Coralista shade - a kind of coral (duh) pinky shade. I'll give a proper review on this in the near future! But in the meantime, here's a little preview! Also, anyone who may find themselves in Leeds, if you go to the Benefit counter in House of Fraser and have a makeover then buy a product, if you quote my blog name (Robyn Mayday) you'll get a free gift. Now, I'll admit there is something in it for me, if I get 30 readers of my blog to do this first, I can win a load of Benefit goodies. 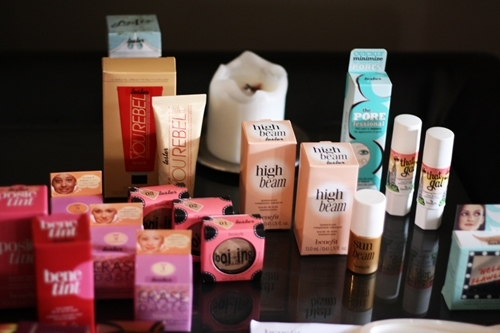 But if I did win them, I'd love to do a giveaway of Benefit stuff (of about half of what I'm given)! Sorry this was quite long, but there were a few important bits I wanted to let you guys know about! Benefit is the quirkiest cutest cosmetics brand out there in my opinion and it was great to have an event for Northern bloggers! Let me know if your excited about the new lip glosses! very intruiged at the lipgloss, love the packagaing & can't wait to hear your thoughts..